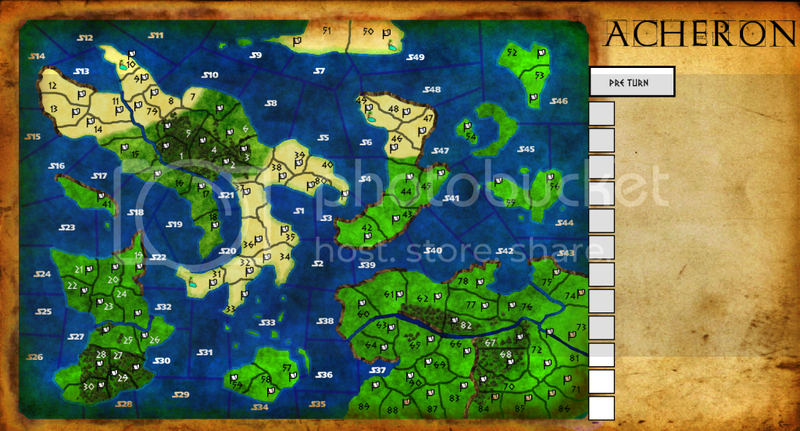 The game is a Strategy game where Kingdoms fight to take control Of Acheron. Now the most interesting part of the game is that players design their own kingdom (write the story, create the units with a unit designer rule set) so its great for those who are creative or always wanted to play a race in Warhammer that had no book or has no book. The game of course isn't like Warhammer in that its closer to Axis and Allies and Risk as it is a territory grab game, Every territory is worth RP and RP buys troops, boats, special units, boats ect. Your Kingdom also gets to design 1 Special Character or as we call them 1 Hero which can be as strong as a Unit and have special actions like your special units. I have mentioned special units twice now and well I think I better explain what they are. Basically there is 5 Special units the first a Scout (which can steal from kingdoms and spy on there territories giving you exact troop counts, they also have lots of cool missions they can do like Assassination and Hinder Building) Mages are your spellcasters they can choose when you build your Mage Tower what lore to use from the following Fire, Water, Wind, Earth, and Death each lore has specific advantages and disadvantages but they give players even more choices that make their kingdom unique. The next thing are priests which can follow a different religion (there is several created ones but you can make your own too) His Religion allows him to cast prayers through Faith. Siege weapons which barrage the enemy before a fight, and flyers which can be used to fly across territories giving you the ability to attack the unguarded. Now this game is not just mindless war there is a great deal of political intrigue and exchange between Kingdoms, players can create public alliances to trade and gain profits and there is much Questing in a sort of Roleplaying Game Fashion. The lands of Acheron are not to be taken lightly, from the scourging heat of its barren deserts, to the lurking horrors that await within the woods. Acheron's native population is made up of several small Principalities ruled individually by Princes, Kings, Barons whatever titles they choose to bestow upon themselves, these leaders trade with one another and have light skirmishes with each other in the pursuit of gaining more land, many of the leaders inherited the lands in Acheron as scraps from their family perhaps for dishonoring their family or in other cases these are the only land titles they could acquire with their lowly family name, but in all cases the lands are plagued by all manner of problems. Talendors landing has been permitted by Prince Courdain Second son of King Mindin's Cousin, Prince Courdain is the last hope for Talendors success he holds the title to the last owned lands of the Kingdom and the future of Talendor lies on the success of the lands in which he owns. Kingdoms have come to Acheron for many reasons, some seek conquest in destroying the Principalities, others seek safe haven, while others merely seek trading partners and land in this part of the world for access to trading with the Kingdoms of Icza and Ushatabi. Middle Aged, Newest to Acquire land which was a gift through marriage he has arrived to see if he can turn the land owned here in Acheron to a profitable gain for himself, he knows the least of the folklore of the area. The Lands of Achreon await, the howls and stares of the creatures greet your people unkindly, and let the challenge for survival commence. Welcome to the 8th installment of Castles.